As I made my Weekly Menu Plan this week, I decided to try a new recipe: Mexicali Corn. I’m not a big recipe follower, but I did decide to add an ingredient to my shopping list that I have never purchased. 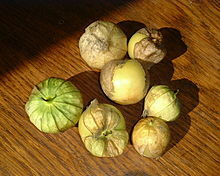 Tomatillos. I didn’t even know where to look for them. And I certainly can’t pronounce the word. And with my luck, the manager at the store looked like he was fluent in Spanish. I did the nervous innocent shopper thing and asked the manager if he knew if they sold those green-Mexican-tomato things. The word “tomatillo” rolled off his tongue with a flare I can only hope to emulate one day. It cost $0.48 for one usable sized tomatillo. And I am looking forward to trying it out in the recipe later this week. If it’s edible, I will share the results.